Coriander Studio is a printmaker and publisher. We specialise in producing limited edition silkscreen and digital prints for publication by artists, other publishers and museums worldwide. In 1973 our studio started with a single screen bench set in a garage, 41 years on in 2014 Coriander relocated to Worton Hall Studios; a former film studio. Also based at Worton Hall are both The Curwen Studio: one of the UK’s oldest lithographic print studios which has a wealth of vintage presses, and Huguenot Editions printmakers and publishers specialising in etching and run by Simon Lawson, etching tutor at the Royal Academy. We also have one of the UK’s largest etching presses and screen printing tables. We take commissions from artists, publishers and museums. 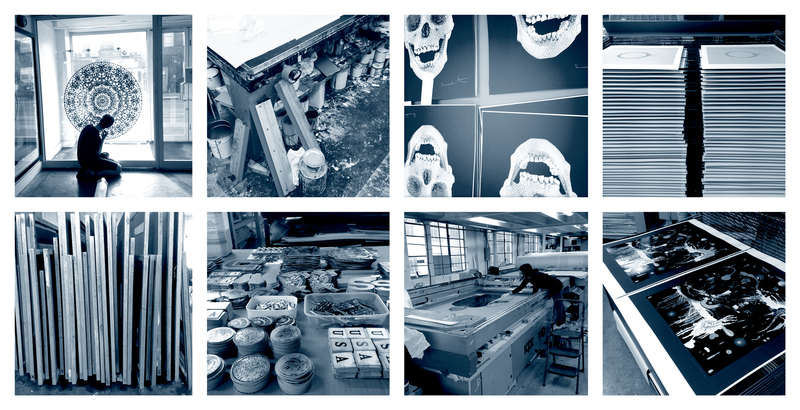 The studio has facilities for silkscreen (which can be used in combination with lithography or etching) digital and 3D printmaking, working with our in-house partners Curwen and Huguenot. We tailor our approach to the individual needs of each project and work collaboratively with the artist or from a brief. Our printmakers and technicians support artists in exploring their work at every stage of the print process from digital manipulation, creation of stencils, proofing and editioning to hand finishing. We produce work as limited edition and unique prints as well as boxed portfolio collections. We are staffed with a hard-working team dedicated to the craft of exceptional print production.